And here it is, my poster for tonight's mid-season finale of DOCTOR WHO, "The Angels Take Manhattan", aired on BBC America. I am not gonna add too much cause I don't want to spoiler the episode for those of you who haven't seen it yet, but it was a REALLY GOOD one. And the Weeping Angels are some of the scariest thing I have seen on all WHO (and not WHO) seasons. As promised, here's my minimalist poster for the new Doctor Who's episode "The Power of Three" aired tonight on BBC America. As usual, I am also posting the pencils (below) - done while watching the episode - for the poster. As promised, here's my minimalist poster for the new Doctor Who's episode "A Town Called Mercy" aired last night on BBC America. And - as usual - I am posting also the pencils (below) for the poster done while watching the episode. I did 2 sketches for this one: the one that you see here and another cool imagery for the episode. Maybe I will ink it later, when the season goes in hiatus for the winter break, yes? And to keep it in the WHO spirit, yesterday I received my comps of the cover (and cover sketch) I did for IDW's Doctor WHo/ Star Trek TNG crossover ASSIMILATION 2 miniseries. Check out the picture below: hopefully you guys have been picking up this books as well. A little late 'cause I was at the Baltimore Convention this past weekend and away from my TV and drawing board, but here's my minimalist poster for Doctor Who's episode "Dinosaurs On A Spaceship" aired last Saturday on BBC America. Below the pencils for the poster done while watching the episode. the first issue of a new Captain AMerica mini I am drawing is coming out today in the stores all over the Country. It's CAPTAIN AMERICA and BLACK WIDOW #636, and it's written by my dear friend Cullen Bunn and illustrated and colored by yours truly. You can check the large 7-pages preview above (click on the image for larger view) and hopefully decide to pick up the book in the stores. • It's only 2.99 bucks. 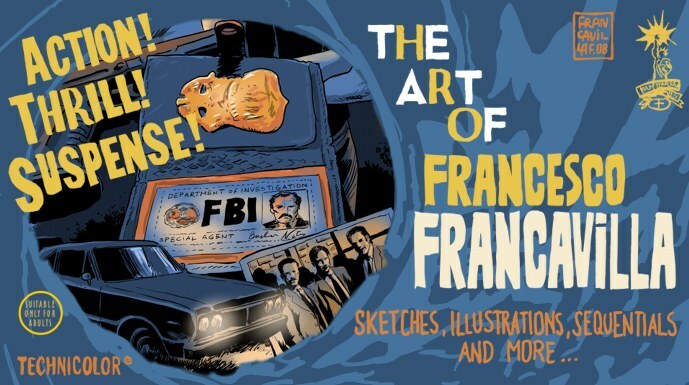 Brand New FF Store for Art, Prints, Books! Original Art, Limited Prints, Art Books!!! I am updating the store with new items so please check it often. 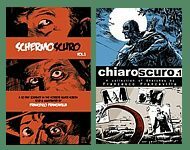 I do most of the announcements of new items via TWITTER - you can follow my feed @f_francavilla to be up-to-date with what is on sale on the store page. If you are interested in a print that is not yet on the store page, pls contact me for availability. MONDO's CREATURE FROM THE BLACK LAGOON(24" x 36" screen print. Signed and numbered AP edition of 23 - only 15 will be on sale). These are the Artist Proofs of the sold-out special San Diego Comicon 2012 Mondo edition. Printed by D+L Screen Printing. All prints are signed, numbered, and remarqued - I planned a very cool and nice way to fit the original art in the design of the poster. This item will be on sale this afternoon (EST) Sept 6. Exact drop time will be announced on twitter (@f_francavilla). Thanks!